Leave's Eyes singer Liv Kristine is back with her latest solo album. 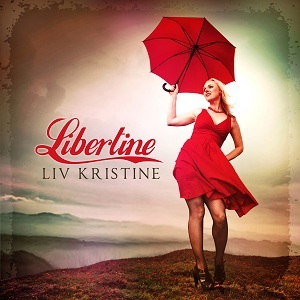 Libertine is her fourth solo album. Liv has an impressive track record, first as the singer with Trail of Tears and then with Leaves Eyes. While she's known as a rock/metal singer, her solo albums are more pop/rock. In other words if you're hoping this is another Leave's Eyes album under a different name, then think again - it's quite different but is definitely going to be of interest to a lot of Leaves Eyes fans. "Solve me" is a fast paced pop-rock song. "Vanilla skin delight" is a duet with Tobias Regner - a former winner of the German series of Pop Idol. It's a great track and is an obvious choice to be released as a single at some point. "Libertine" is a great rock track which will definitely appeal to Leaves Eyes fans. The last track on the album is a cover of the Kate Bush song "The man with the child in his eyes". To record a Kate Bush cover shows plenty of confidence as Kate Bush has such as fantastic voice against which any cover will be judged. Liv Kristine has done a straight cover rather than trying to rearrange it, and I have to say I'm impressed. Liv's voice sounds great here and the simple nature of the song (it's mainly the vocals and a piano with any other instruments kept low in the mix) means that any vocal weakness would be exposed and easy to hear, but there is nothing like that here - Liv's voice is strong and beautiful and she does an excellent version of this cover. There's a really diverse selection of songs on this album, from ballads, to pop to rock, and yet all of them feel like they belong on the album. A great album.